Army-Navy home games are at the Duffield Sports Center. Key players: John Carter (Athlete), Jamison Wilson (RB), Alieu Corr (OG-NG), Chance Meeks (MLB-TE), Mitchell Davis (WR-CB), Drew Thomas (OG-OT), Lance Fatiaki (C-DT), Matthew Kim (RB-LB), Payton Albrecht (TE-DE), Kyle Crumbaker (PK-P). Scouting report: Coming from Oceanside, Brunson knows all about winning and he expects the Warriors’ fortunes to turn around quickly. Carter will be a force on the offense somewhere after rushing for 55 yards, passing for 230 yards and catching passes for 41 yards in 2014. Wide receiver may be in his college future, perhaps in the Ivy League. Wilson will be the big threat out of the backfield. On defense, Brunson promises lots of pressure as long as the secondary can hold up. Thomas, Fatiaki and Albrecht are just sophomores, but the trio should play key roles this season. Key players: Adam Soberon (WR-FS), AJ Vansant (RB-LB), Ty Patterson (HB), Jaxon Racciato (LB), Caleb Moen (QB), Caleb Crist (DE), Kyle Kirby (TE), Zack Soto (DE), Jacob Mizel (DB), Trevor Crist (WR-DB). Scouting report: Coming off a fine season, the Caimans continue to find new players, going from 40 players in the program in 2013 to nearly 90 now. 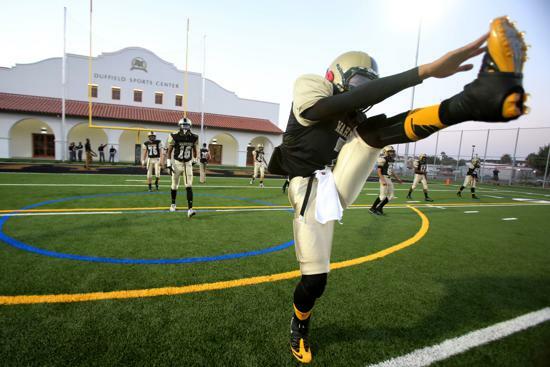 For the first time ever, there will be a junior varsity team as well for the Escondido school. Goodman is yet another believer in the wing-T offense that relies on the running attack. Vansant and Patterson will share those duties while Moen will make defenses pay for not respecting the pass. Key players: Mutula Kwangaba (RB-CB), James Frazier (QB-FS), Sean Carbajal (RB-LB), Cameron Williams (WR-S), Josh Seo (LB-OG), Jake Fisher (WR-CB), Tyler Bartlett (C-DL), Jake Zimmerman (WR-S), Logan Stuart (LB-OG), Alex Bolas (LB-OT). Scouting report: The White Tigers got an early start on this season, winning the final two games of the 2014 season after an 0-8 start. The team’s stated goal, after 0-10 and 2-8 seasons in the seniors’ recent past, is to finally get the school’s first playoff win. Kwangaba will be the key. He rushed for 1,272 yards and 13 TDs and should get even more carries this year until Frazier matures a bit at quarterback. Seo, who is entering his third year as a starter, is the top returning tackler with 49 stops a year ago. Kwangaba (33 tackles) is also a force on defense. Key players: Christian Dufresne (QB), Colton Allen (MLB-C), Christian Munoz (NG-OT), Jackson Hee (RB), Tyler Pinuelas (TE-DE), Kevin Gunn (S-WR). Scouting report: Ron Allen believes good things will happen this season, like scoring more points and posting a winning record. His hope is a 6-4 regular season. Much will depend on whether Dufresne can repeat last year’s effort with 2,247 passing yards and 26 TDs. The defense appears to be primed as well with a pair of first-team all-league picks in Pinuelas (50 tackles) and Gunn (55 tackles) back along with two second-team all-league defenders in Colton Allen (39 tackles) and Munoz (49 tackles). Pinuelas was the Player of the Year on defense. Key players: Isaac Schwan (WR-SS), Jake Bronson (RB), Trevor Sheng (RB), Christian Cortes (QB), Kyle Lanzer (CB), Matt Dewildt (WR), James Rohde (WR), Sam Zanella (MLB), Antonio Partida (OG), John Bothe (TE). Scouting report: Last year the Eagles caught fire in week 3 to finish the regular season with a winning record and the Ocean League title. Cortes leads a balanced offense after throwing for 2,198 yards and 29 TDs as a sophomore while Bronson ran for 1,004 yards and scored 12 TDs and Sheng averaged 6.1 yards per carry and caught 27 passes for 323 yards. The defense is loaded with Schwan (55 tackles), Bronson (60 tackles), Sheng (50 tackles, 4 interceptions), Lanzer (29 tackles), Dewildt (51 tackles), Zanella (30 tackles) and Partida (50 tackles). Key players: Andrew Reitmeyer (QB-LB), Ben Graves (WR-ILB), Josh Pichette (OL-DL), Nate Thurman (WR-DB), Brandon Seward (OL-DL), Luke Medrano (PK-P), Peter Ferguson (OL-DL), Jordon Comma (RB-CB), Roman Gonzalez (RB-OLB), Braxton Mihlik (OL-DL). Scouting report: Goodwin, the former director of character development at Southern Miss., who took over when longtime coach Rick Brown retired, lost eight players either to graduation or transfer. Reitmeyer will trigger the hurry-up spread formation passing attack with Graves and Thurman being the main targets. Comma did not play football last year but was a CIF qualifier in track last spring. He brings an element of speed to the ground game. Goodwin likes what he sees up front from Pichette, Seward, Ferguson and Mihlik. Former Vista standouts Salo Faraimo and Robert Guerrero have been added to the coaching staff.